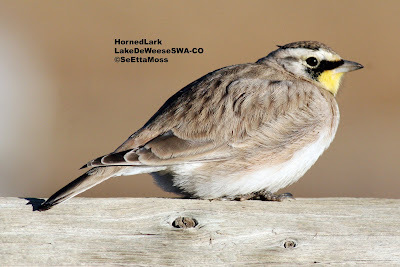 I spotted this Horned Lark while birding in the Westcliffe,CO area including Lake DeWeese. This is part of the Wet Mountain Valley, a high elevation (8,000 feet)mountain park, that sits between the Wet Mountains and the Sangre de Christo Mountains; This area is primarily ranch land with a lot of hay production but was originally short grass prairie. In the top two pics one of it's orbital tufts, referred to as horns (and thus the name Horned Lark), is erected and visible on the far side of the bird. Both tufts can be seen in the bottom pic though they are barely extended. This is one of the previews for what sounds like an exceptional documentary made for tv-MSNBC- by Jeff Corwin. 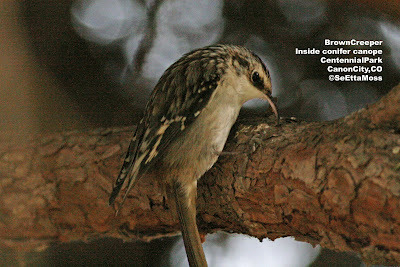 These pics are also what I consider intimate views, this time of a Brown Creeper as it probing between the bark of a conifer. Again I am hand-holding the camera--I can't imagine getting these shots if I had to use a tripod as I was under the canopy of the conifer and had to adjust my position quickly as the creeper moved over and under the branches it was working on. Besides lots of small branches in my way, the other big challenge was that it was dark inside the canopy.